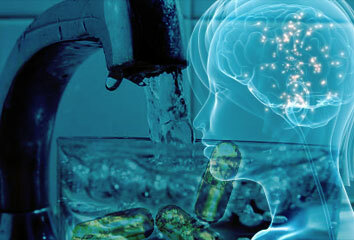 Oxford professor Julian Savulescu says fluoridation demonstrates how populations of the future could be mass-medicated through pharmacological ‘cognitive enhancements’ added to the water supply. But once highly safe and effective cognitive enhancers are developed – as they almost surely will be – the question will arise whether they should be added to the water, like fluoride, or our cereals, like folate. It seems likely that widespread population level cognitive enhancement will be irresistible. The dream Savulescu argues for is based upon the lie that fluoridation of the public water supply has been a tremendous human advancement. Supporting that lie is the boasted claim by the Center for Disease Control that water fluoridation ranks among the top 10 public health achievements of the 20th Century. Instead, fluoride has been linked with neurological effects, thyroid problems, bone cancer and even crippling-blindness. What’s more, much of it is not even the common-but-toxic sodium fluoride, but an industrial waste derivative known as hydrofluosilicic acid— in an estimated 2/3 of the fluoridated public water in the U.S. and known to be very deadly. Savulescu is flawed to hope fluoride can pave the way to an alchemically-“improved” society, especially where forced-medication is involved. The vision is distinctly like that of Brave New World, wherein author Aldous Huxley predicts a future dictatorship where people “learn to love their servitude.” What Huxley terms in the novel “Soma” would most likely come in reality in the form of numerous drugs that would tackle individual happiness, and the larger complacency of the masses at large. Solidified by a Scientific Dictatorship, a pharmacologically-treated population would be rendered very unlikely to ever revolt against the regime in power. A ‘scientific’ form of control doesn’t necessarily imply the rise of enlightenment or technological innovation, but rather the guaranteed control of its population through a tested understanding of human behavior– including breaking point, resistance, anger– and the the ability to systematically stay one-step or many more ahead of what anyone might do. So could “cognitive enhancers” like Ritalin, Prozac and other chemically-engineered drugs be added to the water supply in the future to make humans better, smarter or faster? Or could they make humans docile, complacent and dangerously subservient? Such proposals are already underway, and what’s more, whether intentional or not, spiked water supplies are already affecting populations in the U.S. and across the globe. Moreover, the AP exposed in 2008 that pharmaceutical drugs were found in the majority of the United States’ water supply. According to the AP, at least 46 million people are affected by the issue. The U.S. Geological Survey lists the “emerging contaminants in the environment” and specifically notes what is affecting the water supply. Contaminating compounds range from herbicides to pharmaceuticals, endocrine disruptors and household chemicals. More shockingly, population control advocates like White House Science Advisor John P. Holdren have advocated adding sterilants to the water supply. He wrote about it alongside Population Bomb author Paul Ehrlich in their 1977 book Ecoscience. Sir Macfarlane recommended in a secret report in 1947 that biological and chemical weapons should be developed to target food crops and spread infectious diseases. His key advisory role on biological warfare was uncovered by Canberra historian Philip Dorling in the National Archives in 1998. “Specifically to the Australian situation, the most effective counter-offensive to threatened invasion by overpopulated Asiatic countries would be directed towards the destruction by biological or chemical means of tropical food crops and the dissemination of infectious disease capable of spreading in tropical but not under Australian conditions,” Sir Macfarlane said. Alex Jones recently exposed the fact that all the adulterated and dangerous chemical additives in our food and water are put there intentionally as put of a larger eugenics program. It’s a brave new world indeed where Oxford professor Julian Savulescu argues for the “Ethics of Enhancement.” In his 2002 paper, “Genetic interventions and the ethics of enhancement of human beings,” Savulesco argues for using gene therapy and drug therapy to make “happier, healthier people.” It could mean adding both mental-boosting and mood-enhancing chemicals to the things everyone eats or drinks. 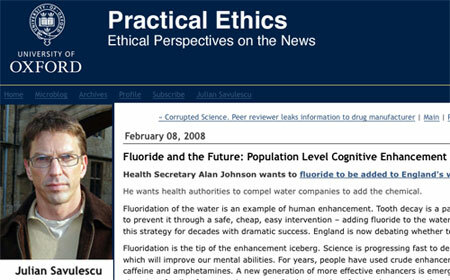 It is interesting that Savulescu mentions fluoride alongside “cognitive enhancements,” as many critics have pointed towards the use of fluoride in Nazi concentration camps to keep the inmates passive, and questioned whether a docile population is a hidden purpose of the water fluoridation campaigns in the United States and post-war Western world. Further, fluoride is a basic ingredient in both Prozac, which is the leading brand-name for Fluoxetine (FLUoxetene Hydrochloride) as well as Sarin nerve gas (Isopropyl-Methyl-Phosphoryl FLUoride), which are fundamentally mind-altering substances. Fluoride isn’t the only controversial substance Savulescu terms as an advance in human civilization. He touts the widespread use of Prozac and points to the use of Modafenil, an amphetamine, to keep Air Force pilots alert during missions in Iraq. Savulescu is also a proponent of most types of genetic-enhancement that have been proposed. He sees experiments like the genetically-engineered “supermouse” as a model for the potential supermen of the future. However, all of these “enhancements” come with risks. Genetically-engineered foods have proved deadly and dangerous; gene-splicing has proved to have unforeseeable consequences; fluorides and pharmaceutical chemicals pose dangers of addiction, brain damage, cancer or other problems. Savulescu’s vision is distinctly “transhumanist” a branch of the eugenics movement which seeks to improve the human species to the point that highly-gifted individuals would transcend into a new & improved proto-human species– becoming godlike creatures with unique creative potential and abilities. Transhumanism was first termed by UNESCO founder Julian Huxley in 1952, the grandson of Charles Darwin’s partner at the Royal Society of Science, T.H. Huxley. “I believe in transhumanism”: once there are enough people who can truly say that, the human species will be on the threshold of a new kind of existence, as different from ours as ours is from that of Pekin man. It will at last be consciously fulfilling its real destiny. That philosophy of Transhumanism, moreover, is necessarily rooted in the Eugenics movement of the early 20th Century that was led by the scientific elite of the Royal Society, which included Charles Darwin, his cousin Francis Galton and Thomas H. Huxley. This circle and their allies floated Utopian visions for a scientifically- and eugenically- engineered society that would be progressive and even transformative, theoretically producing a ‘better’, albeit tightly-authoritarian society (science demands control, in that sense). However, proposals to add medication to the population’s water supply are involuntary, and would violate individual rights. It would be mass-medication, and avoiding the substances treated with it would be costly, burdensome and difficult to do with any finality. Savulescu apparently views compulsory water treatment in the same vein as compulsory vaccinations, and anything else that can be justified on a public health care basis, even when such treatments prove not to be healthy at all. Additionally, while the figures of “liberal eugenics” which Savulescu looked up to often espoused semi-tolerant “voluntary” proposals, it was always clear that the long-term vision encompassed measures of control ‘for the betterment of all’ that could not function under voluntary or ‘democratic’ conditions. What’s more, eugenical laws passed in the 1920s and 1930s in the United States and Britain— some of which weren’t repealed until the late 1970s– gave the State authority over forcible sterilization and beyond. Thus, these “voluntary” enhancement-visionaries have already crossed the line of trust and betrayed the fact that they mean to control with force. Advancements and innovations in science, technology and health have obvious potential benefits, but with kind of dangerous ideology driving the science policy, public health is at a serious risk. Worse still, driving the population into that system has been an intentional scheme by certain ideologues. We cannot flirt with ushering a Brave New World knowing its sweet poison is certain despotism.